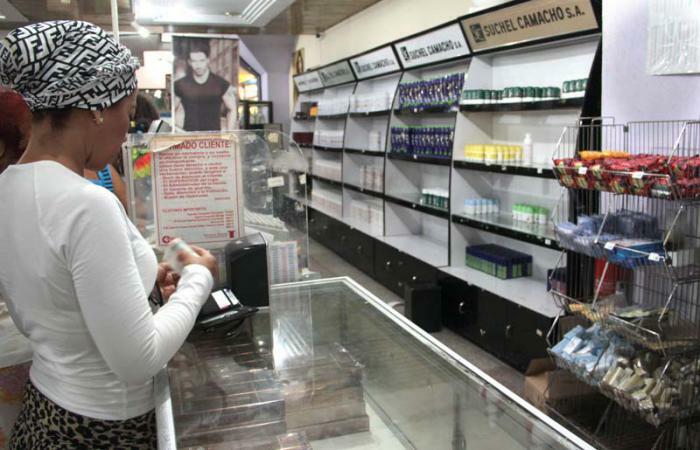 Jeovany Jimenez Vega, 19 October 2015 — In Cuba the shortage of goods, including basic staples, has been a continuous phenomenon in all retail chains for decades, so repetitive that it seems incorporated into the very genome of the regime, and has become one of the hallmarks of the laziness, inefficiency, and mediocrity of the economic and military dictatorship of the Castros. Many alternative websites inside and outside of the island have warned about the phenomenon so constantly that, given its magnitude, even the official press has had no option but to recognize the severity of the problem on more than one occasion. It is not news to anyone that the official voices blame this disaster on the American embargo—which they have inexorably called a “blockade” even though right in front of their noses are windows adorned with goods coming from all four points of the compass. Thousands of times we have been victims of the onerous consequences of living under an autocracy that exercises its monopoly over the entire national network of commerce. This unnatural and comfortable position has allowed inept and lazy despots to flaunt their irresponsibility by gambling with the most pressing needs of my people, and we have witnessed over and over how they raise prices without explanation, or how many times they leave a particular product on the shelves for years because due to its poor quality the only way to get rid of it is to force its sale. But what is happening today in Cuba seems to be different and I suspect that this time something more is being arranged behind the scenes. During the past year we have witnessed a worsening of this phenomenon to an unexplainable extent, and we have seen a greater shortage than usual, perhaps the most acute and long-lasting since 1994. All Cubans have observed this in their own place of residence, and have also learned that the situation is the same, if not worse, in other locations. Especially in recent months the shortages have been so apparent and widespread, have gained such intensity throughout the entire country, and have been so prolonged that it makes one suspect that this is not just another cyclical crisis of scarcities in supply—recognized even by the deaf-mute State newspaper Granma—but this time we could be facing a crude tactical maneuver to achieve a specific short-term goal. This is something happening against the tide, during times in which there should be relative improvement, given the winds that have blown since last December 17 (the day the United States and Cuba announced the resumption of relations). But from the thinking and actions of the olive-green clique, they seem not to perceive it like that, and everything indicates that they have preferred to reset the sails according to their unhealthy inclination of maintaining control at all costs. A very simple fact demonstrates the profound contradiction: in accordance with the license granted by Congress, Cuba imported $710 million in food directly from the United States in 2008, but in 2013, in contrast, it imported only $348 million, and in the first half of 2015 it decreased even more, buying only $119 million. So they consolidated this decline at the same time as they were advancing the secret negotiations with the US government during 2014, and then, paradoxically, intensified it after the proposed bilateral thaw was made public. So the questions arise: Could it be that our military autocracy is convinced of the imminent fall of its strategic ally in Caracas at the next elections and is preparing us now in order to minimize the inevitable impact that the suspension of the Venezuelan subsidy will cause? Or maybe the assertion of US Congressman Rodney Davis is coming true, about the impending monetary unification in less than a month, and the Cuban government finds it necessary, for some mysterious reason, to have a record of minimal wares then available for sale? Or maybe it’s all merely a tactic designed to maximize the psychological perception of improvement when the clique unveils its next opening, while freeing for sale all the merchandise that today is deliberately hidden, in order to “prove” that this systemic shortage always was, indeed, the fault of the “Yankee criminal blockade” and no one else? Maybe they don’t want to give us any breathing room in case the elections of 2016 do not produce a Democrat successor to guarantee the continuity of the process initiated by Obama. Or they’re just afraid to risk that we would demand some changes in the rules of the game too quickly for Raul Castro’s taste (he is addicted to “changes” without haste and with many delays), or that we would too quickly sniff the aroma of the proposals from the North that ultimately they are not willing to allow. Maybe it’s one or all of these reasons. But aside from all the speculation one thing is without doubt: the Cuban dictatorship’s short- and medium-term plans include none that even remotely contemplate any real improvement in our standard of living, much less any effective opening to commerce that would in any way empower the Cuban people; and to accomplish them, there is nothing like promoting this perpetual shortage, which after all has demonstrated its undeniable effectiveness in dividing the attention of the masses and preventing them from focusing on uncomfortable issues. No one doubts that the evil intentions on Havana’s Mt. Olympus are more than sufficient to devise such a mean-spirited strategy . Jeovany J. Vega, Translator: Tomás A.